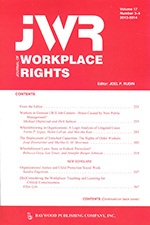 Journal of Workplace Rights, published by Sage Publications (formerly Baywood Press), is the continuation of the Journal of Individual Employment Rights which ended with volume 12. Newly named as the Journal of Workplace Rights, it focuses on all human rights that can be affected by the employment relationship. This journal has now been triggered from the CLOCKSS Archive. In keeping with its unique mandate, CLOCKSS is proud to offer continuing and public access to volumes 13-17 of the Journal of Workplace Rights. The Journal of Workplace Rights content is copyright Sage Publications and licensed under a Creative Commons Attribution-Noncommercial-No Derivative Works 3.0 United States License.